Professor Steve Afolami of the Department of Crop Protection, College of Plant Science and Crop Production (COLPLANT), has advocated the importance of ensuring that the various researches being carried out in Nigeria have national focus. The Don stated this while assessing the impact of research on the fortunes of the country, saying that it was high time Nigeria closed its eyes to foreign researches and looked inward to identify peculiar problems with the hope of finding appropriate solutions to them. 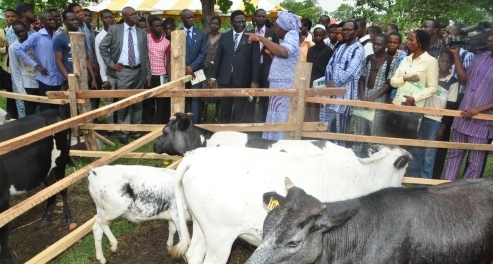 In the light of this, Professor Afolami has expressed the hope that FUNAAB would keep performing this noble role of engaging in impactful researches with national focus, through its Agricultural Media Resources and Extension Centre (AMREC), as well as the Institute for Food Security, Environmental Resources and Agricultural Research (IFSERAR), saying that “I have always wished that there would be a national focus. For example, the Federal Ministry of Agriculture, in collaboration with The Presidency, could identify problems, seek for solutions and follow-up to a logical conclusion; no matter how long it takes and without any form of distractions”. The Professor of Plant Nematology, further disclosed that root-knot nematodes, Meloidogyne species, remained the main nematode problem facing the Nigerian farmers, without them knowing. “Nematodes are microscopic, that is, they are small organisms that require a microscope to see them. Most often, the adverse effects of nematodes are wrongly diagnosed as nutrient problems having to do with the soil. It is only after the soil had been treated and no solution found, that people would recognise that something else could be the problem. “Now that nematology as a science is spreading and more scientists are being produced in that area, at least in Nigeria, farmers are beginning to realise that a good number of their crops are devastated by nematodes”, he added. Professor Afolami, the incumbent Vice-Chancellor, Augustine University, Ilara-Epe, Lagos State, revealed that FUNAAB had contributed immensely to carrying out of the research on nematodes with the development of an improved method of screening nematodes that is considered as a great contribution by the University towards the science of Nematology. Calling nematodes the “farmers’ unseen enemy”, the Don said not all nematodes were actually enemies, as some of them are used to monitor the environment, while some others are used to control insects, such as the Beetle larvae. Some nematodes equally assist in ensuring the stability of soil by feeding on plant-parasitic nematodes, as predators. Professor Afolami lauded the efforts of FUNAAB in rewarding academic excellence, through the award of scholarships through which the University had produced several brilliant students, who had become Professors, such as: Jonathan Atungwu, Lateef Sanni and Kolawole Adebayo, who are doing well and excelling on the global level. He affirmed that the study of nematodes would ensure food production in the country, warning that failure to pay adequate attention to the havoc attributable to the organism could have adverse consequences for food production as it happened in Europe when potato destruction, that was linked to nematodes, caused food shortages that almost led to the collapse of governments. He further said that concerted efforts were being put together to reduce the negative impact of nematodes on crops, thereby increasing food production. He also advocated extension nematology for farmers’ education. Professor Afolami, who is also a former Dean, Postgraduate School of FUNAAB, said the major challenge facing Nematology research is that there is very little that could be done without having to always look down into a microscope, and many students do not seem to like that. “Identifying and counting nematodes in a particular soil sample can be done more rapidly with the use of new designs of microscopes, but the problem is that in a soil sample, that has not been sterilised and inoculated with a specific nematode, you will have to identify the various types before you begin to count them individually, which could be very tasking as it involves picking, separating and determining how much of each type are in a soil sample”, as he advised young and upcoming researchers to ensure they work hard and avoid getting discouraged, by realising that the end justified the means. Professor Afolami, appreciated the University Management for granting him Leave of Absence, which made it possible for him to serve the country, through the Augustine University, promising to sustain the reputation for academic excellence that FUNAAB had worked very hard to build in the last 27 years.